Growing up, I never gave pumpkin seeds much thought. To me they were the seeds discarded when we carved our pumpkins at Halloween. After carving our pumpkins, we’d clean off the seeds and roast them with salt to snack on. Over the past few years, pumpkin seeds have popped up everywhere, and I have grown to truly love them. I now have a container of raw pumpkin seeds or pepitas in my refrigerator at all times, and I throw them into my morning hot cereal, on top of soups and salads, or simply enjoy them as a snack. As an avid cyclist, my husband was concerned with getting enough iron, potassium and magnesium on our new plant based diet. Pumpkin seeds are a perfect choice to incorporate into our daily menu, as they supply all these nutrients as well as many others. Pumpkin seeds are said to help prevent depression as they are rich in L-tryptophan, which helps to improve the mood naturally. They also boost your immunity as they are a good source of zinc, vitamin E and phenolic acids. Pumpkins seeds are also a good source of protein, and fiber. When buying pumpkin seeds make sure they smell fresh, not musty, spoiled or stale, which could indicate rancidity. Organic pumpkin seeds are preferred, so they will not be contaminated with pesticides or other harmful chemicals. Pumpkin seeds are best roasted at low temperatures and do watch them carefully as they do burn easily. I try and keep some healthy, nutritious spread or dip on hand in my kitchen that we can enjoy with multigrain chips or crackers when we crave a snack. 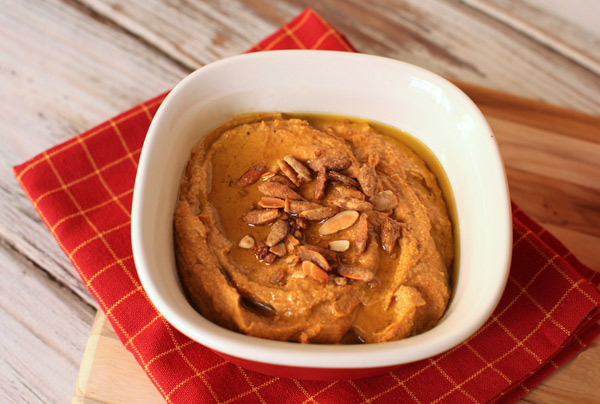 I usually have a homemade nut butter of some type, and often have some flavor of hummus in my refrigerator. I prefer making spreads and dips myself, to ensure they are fresh, and that I know exactly what is in them. I love playing around with hummus flavors and rarely make the same one twice. I decided recently that I’d make a hummus using roasted pumpkin seeds along with chickpeas and some leftover squash puree. The final flavor was delicious, with a just subtle hint of nut butter, and this is one hummus I will often be making! 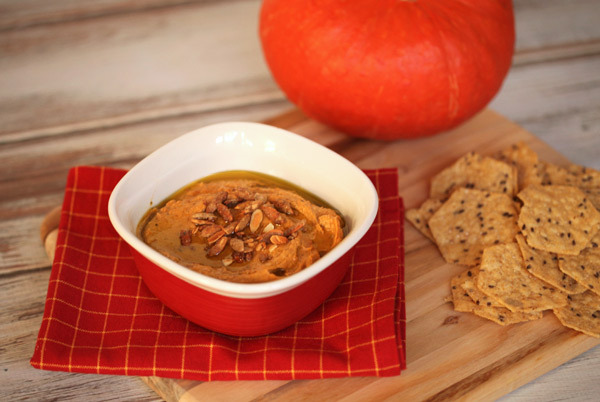 The flavor of this hummus improves after a day or two so it is a great choice to make ahead for holiday entertaining. I made a double batch and froze half, and it was just as tasty once it had thawed. I use this hummus as a spread on our veggie wraps, served with whole grain pita chips, or spread on celery sticks as an afternoon snack. Pumpkin seeds are rich in magnesium, potassium, fiber, protein and zinc.Pumpkins are low in calories, but are a great source of dietary fiber, antioxidants, minerals and vitamins. 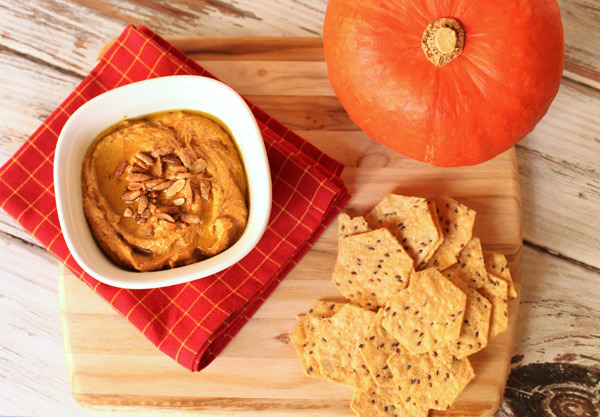 Pumpkins are low in calories, but are a great source of dietary fiber, antioxidants, minerals and vitamins. 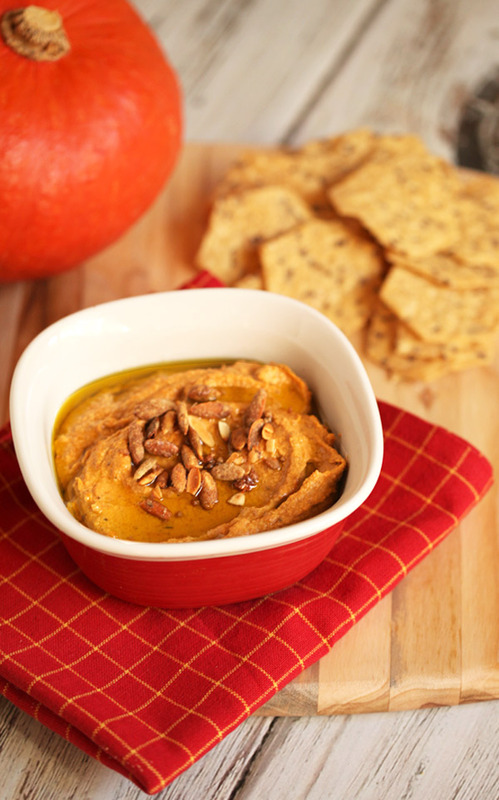 Pumpkin is a rich source of the all-important antioxidant beta-carotene. Chickpeas are a fat free source of protein, are high in fiber & B vitamins. Spread the pumpkin seeds across a baking sheet and roast for 15 minutes or so, or until the seeds have lightly browned. Reserve 1/4 cup of pumpkin seeds. In a high speed blender add the remaining pumpkin seeds, pumpkin puree, chickpeas, tahini, Tabasco sauce, salt, pepper, and lemon juice. Pour in about 1/3 cup of olive oil and pulse until the mixture is very smooth, adding additional olive oil as needed. Scoop the hummus into a bowl, and serve with whole chips or celery sticks.